Akshaya Tritiya is one of the most holy and auspicious days celebrated by the Hindus across the country. It is believed that anything that commences on this day will always emerge victorious. This day is thus symbolic of good luck, success and fortune gains. When is Akshaya Tritiya celebrated? Lord Ganesha and Ved Vyasa strated writing the epic Mahabharata on this day. This day is also celebrated as the birth anniversary of Lord Parashurama, the sixth incarnation of Lord Vishnu. On this day, Goddess Annapurna was born. On this day, Lord Krishna bestowed wealth and monetary gains on his poor friend Sudama who had come to his rescue for help. According to the Mahabharata, on this day Lord Krishna presented the 'akshaya patra' to the pandavas while on their exile. He blessed them with this bowl that would continue to produce unlimited amount of food that would never leave them hungry. On this day, the River Ganges descended from the heaven on earth. 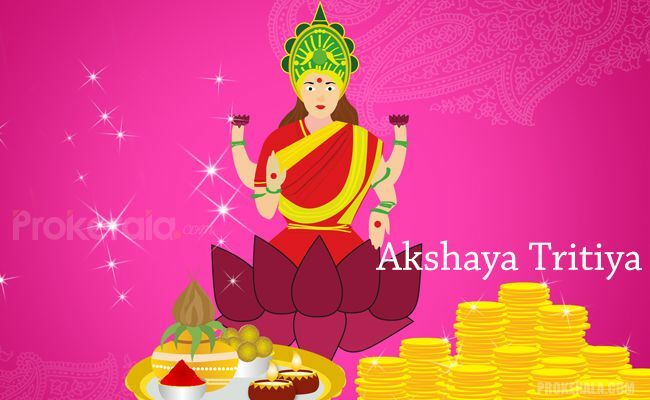 It is on this day that Kubera worshipped Goddess Lakshmi and thus was assigned the job of being the treasurer of Gods. In Jainism, this day is celebrated to commemorate Lord Adinatha, their first God. Devotees of Vishnu worship the deity on this day by keeping a fast. Later, charity is done by distributing rice, salt, ghee, vegetables, fruits and clothes to the poor. Tulsi water is sprinkled all around as a symbol of Lord Vishnu. In Eastern India, this day commences as the first ploughing day for the upcoming harvest season. Also, for businessmen, Lord Ganesha and Goddess Lakshmi are worshipped before starting a new audit book for the next financial year. This is known as 'halkhata'. On this day, many people buy gold and gold jewellery. As gold is symbolic of good fortune and wealth, buying this is considered pious on this day. People plan weddings and long journeys on this day. New business ventures, construction work are started on this day. Other rituals include taking a holy bath in the Ganges, offering barley into a sacred fire and making donations and offerings on this day. Jains complete their year long tapasya on this day and end their worship by drinking sugarcane juice. Performing spiritual activities, meditation and chanting holy mantras is considered important to ensure good fortune in the future. Devotees of lord Krishna embalm the deity with sandalwood paste on this day. It is believed that on doing so, the person is bound to reach the heaven after death.